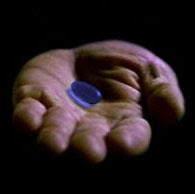 Science teacher: " You take the blue pill and the story ends." Q Why include business in the policy debate about public education? A We all need to work together on this stuff, business leaders and educators. Everyone's mutual interests are absolutely aligned. Everyone's mutual interests are not 'absolutely' aligned, not even close. Many teacher's act in the students' best interests, though not always effectively. Some teachers fell into teaching for other reasons. The business leaders' interests are to increase market share and feed their businesses. I knew Arne had some arithmetic issues--he's confused by his own numbers when he touts his Chicago miracle. He also has some grammar issues--I want to incent him to improve. Now I fear for his sanity. Everyone's mutual interests are absolutely aligned. The bluepill image is from wikia.com.